RIT Venture Creations company Empire Medicinals took first place in the 2017 Rochester Venture Challenge. From left, Luke Luft, Scott Valpey, Chris Carter, Qiaosong George Zheng and Dr. Xinmin Zheng. Two clients of the Venture Creations Business Incubator at Rochester Institute of Technology have won the top two prizes at the 2017 Rochester Venture Challenge business competition, hosted by High Tech Rochester. The winners were announced during the Celebration of Entrepreneurship Luncheon on April 27 at Hyatt Regency Hotel Rochester. 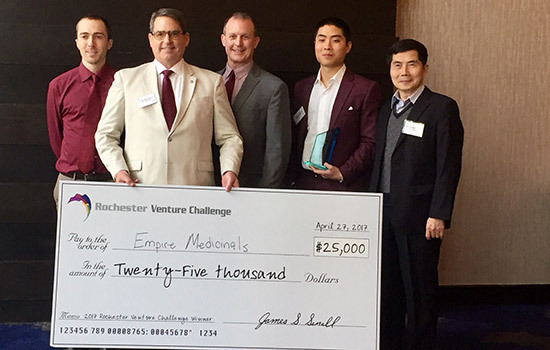 First place—Empire Medicinals, founded by RIT alumnus Qiaosong George Zheng ’15 (mechanical engineering technology), Chris Carter, F. Scott Valpey '03 (business administration management), Luke Luft and Dr. Xinmin Zheng, captured first place and the $25,000 grand prize. Empire Medicinals is a biotech manufacturer looking to advance health and well-being by modernizing traditional herbal medicines through the cultivation, extraction and packaging of USDA organic, natural medicinal supplements. Their first product, Lingzhi Essence, is a dietary supplement made from Ganoderma Lucidum mushrooms, which reportedly addresses issues varying from immune system modulation to relieving fatigue. According to George Zheng, the company deploys current Good Manufacturing Practices (cGMP), certified organic production, and lab testing of every batch to ensure the safety, purity and excellence of the product. Second place—ThermApparel, founded by Bradley Dunn ’15 (industrial design), Kurtis Kracke ’15 (industrial design) and Crystal Mendoza Paulin ’13 (biomedical engineering), took home $5,000 for the second-place finish. ThermApparel is a lower cost, discreet, flexible garment that assists patients with multiple sclerosis, epilepsy, cerebral palsy or other conditions by regulating body temperature in hot weather. ThermApparel also participated in the Saunders Summer Startup program, sponsored by RIT's Albert J. Simone Center for Student Innovation and Entrepreneurship. Venture Creations was created in 2003 to establish an environment in which new technologically innovative business concepts develop into new high-technology businesses. The incubator provides services to incubating companies, to refine and validate business models that match technology solutions with the needs of customers. It was also created to promote economic development and competitiveness in Monroe County and New York state by encouraging and facilitating the transfer of technology resources to the marketplace. Thirty-three companies have graduated from the incubator and together have created 466 jobs.